Department of "Management, Entrepreneurship and Marketing" was organized in July 2015 on the basis of two departments - "Management and Entrepreneurship" and "Marketing and Restaurant and hospitality business" with the aim of training/educating specialists with higher education and with relevant international standards in two specialties: "Management" and "Marketing". The Candidate of Economic Sciences, Associate professor - Sokhatskaya Natalia Pavlovna was the Head of the department from 2006 to 2012. From August 2012 to March 2014 the leadership of the Department was carried out by the Doctor of Economic Sciences, professor Tulembaeva Aigul Nuralievna and since September 2014 – the Head of the Department was the Doctor of Economic Sciences - Demeuova Gulnara Tleuzhanovna. 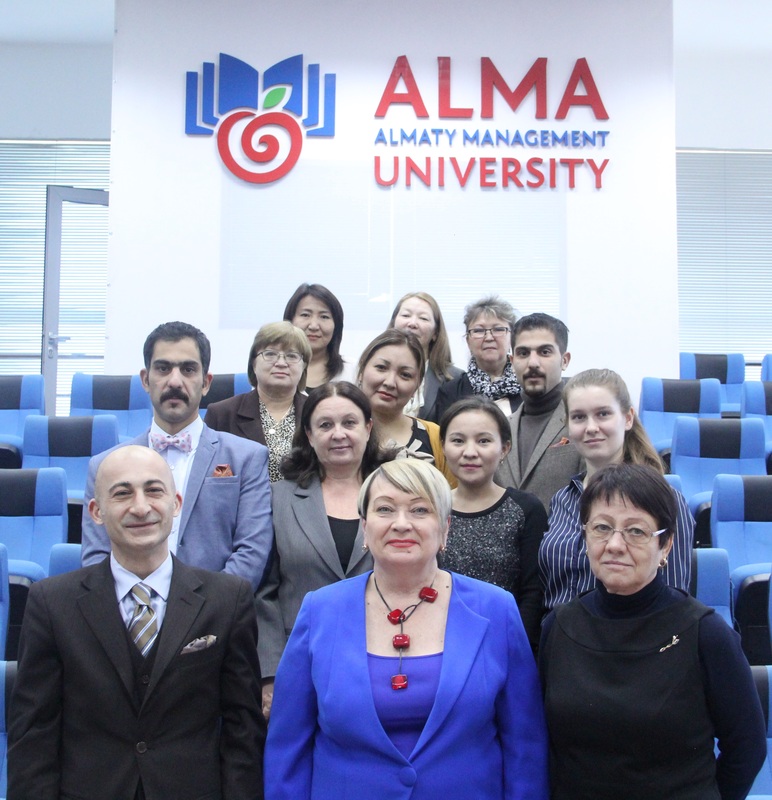 On June 24th, 2015, two departments "Marketing and Restaurant and hospitality business" and "Management and Entrepreneurship" were merged according to the decision of the Academic Council of NEI "Almaty Management University". The Candidate of Economic Sciences - Zaluchyonova Olga Mikhailovna became the Head of the newly established Department: "Management, Entrepreneurship and Marketing". - within the framework of "Management" specialty highly qualified specialists for the leading companies and government agencies of the Republic of Kazakhstan are being prepared. - within the framework of "Marketing" specialty professionals for companies in various sectors of the economy are prepared. - within the framework of "Project Management" specialty masters in project management according to international standards are educated. Undergraduates and graduates prepared by the Department are highly valued on the market. Enterprises and organizations of various sectors of the economy value highly skilled professionals who graduate from the above mentioned specialties. Many graduates of the department are the owners of their own successful business, and actively participate in the life of the University and the department. Teaching faculty of the Department annually updates the content and teaching materials of all courses of basic educational programs for bachelors and masters. In the 2014-2015 academic year, the Department introduced the "Entrepreneurship" course into the curriculum of all disciplines. This course consists of six blocks and is designed for three years of study (1st to 3rd courses). This discipline aims to develop an entrepreneurial potential of every student through learning that is focused on practical application of their business ideas. The department is making a major contribution in improving the educational process of the School of Finance and Management. For instance, the Internet system is effectively used, then the processes of distance learning and electronic educational and methodological development are being carried out on a professional level. All of this resulted in the improved student performance during midterm control weeks and examination sessions. Academic work of the Department is combined with research that allows to enrich the learning process. Scientific activity of the department aims to reveal urgent problems in the field of economics, management and marketing. Problematic issues are being discussed at international and national conferences, seminars and publications on the results of these studies are reflected in articles, compilations and monographs. The strategic plan of the Department of "Management, Entrepreneurship and Marketing" provides for further development of research with a view of its practical application on the market economy, as well as it is directed at collaboration with enterprises and organizations. It is noteworthy to say that faculty of the Department - Masakova S.S. and Kenzhegaranova M. K. were awarded MES grant (the "Bolashak" scholarship) and among other issues studied international experience of governance in countries such as Spain and the United States. Lecturers have improved their skills (teaching skills etc) in countries such as Germany, USA, Slovenia, Russia, Latvia and others. The staff of the department organize student scientific and practical conferences for youth with the aim to provide a bridge between their theoretical and practical knowledge. Also, various practicums, workshops and seminars are being conducted in order to maximize a practical orientation of the learning process.